The road to Milford is arguably one of the world’s best alpine roads. Winding through a constantly changing landscape, the road reveals rivers, lakes, tussock flats and of course the many mountains that give Fiordland its unique character. The Milford Road is one of New Zealand’s great scenic routes, the road was started during the Great Depression in 1929, but it was not completed until 1953 as work came to a halt during World War II. The journey from Te Anau to Milford Sound is a stunning scenic experience and it takes you through part of the South West New Zealand World Heritage Area, one of the great wilderness areas of the southern hemisphere. Despite its remote location, many people travel along the Milford Road each year, particularly in the busy summer season (October to April). Drivers will be sharing the road with cars, coaches, camper vans and minibuses. There is less traffic in the months (May to September) but the road conditions require more caution. The following information will help you to prepare for your journey along the Milford Road and enable you to get the most out of your trip. The Homer Tunnel was completed, at 1953 and opened up Milford Sound to road access. The Tunnel, at 945 meters above sea level, is 1.2km long and has a steep gradient down towards Milford. 29km The sheltered harbor of Te Anau Downs is the departure point for Milford Track walkers, or those wishing to travel to Glade House. 85km The Divide. Departure point for those wishing to walk the Greenstone or Routeburn track, or climb the mountain to Key Summit. 109km A set of spectacular waterfalls cascading through eroded rock formations, give The Chasm its unique name. The journey from Te Anau to Milford Sound and return (along the same route) is 240 km (144 miles). An eight hour day is needed if you plan to take in the many scenic sights and short walks along the way, and do a boat cruise on Milford Sound. From Queenstown the return trip is even longer - 600 km (360 miles) taking 12 - 14 hours. So, for your comfort and enjoyment, we suggest that you plan your return trip from Te Anau. 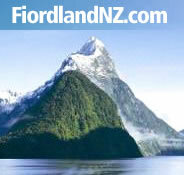 Over 400 000 people visit Milford Sound each year, most during the summer season. Many visitors plan their arrival in Milford to coincide with boat cruise departure times. This can result in congestion at some of the scenic stops along the Milford road during peak times. The majority of coaches depart from Te Anau between 9am and 10am and arrive at Mirror Lakes around 10.30am, Knob’s Flat at 11am, The Chasm at 12.30pm and Milford Sound for the 1pm cruise. By avoiding this pulse of traffic, your Milford Road experience will be more relaxed, with less disturbance from the heavy coach traffic and high numbers of visitor. If you have limited time, a nonstop direct drive from Te Anau to Milford will take at least 2 hours. There are no shops or fuel stations between Te Anau and Milford Sound. A limited selection of food, drink and fuel (petrol and diesel) is available at Milford Sound and Gunn’s Camp (petrol only), which requires detour down the Hollyford Valley Road. Refreshments are also available on the boat cruises. Public toilets are only available at Te Anau, Knob’s Flat and Milford. Remember, dogs are not allowed in the National Park. If you’re planning a relaxing day, taking time to stop and experience all that the Milford Road journey has to offer, make sure that you have a full day, a full tank of fuel before leaving Te Anau, and take food and beverages with you. It is also recommended that you take insect repellent. Ensure that your fuel tank is full before leaving Te Anau. The road, although sealed and maintained to state highway standards is, nevertheless, a challenging drive. Milford Road is a scenic highway and everyone will travel at different speed. If you are holding up other travellers please be courteous, pull over at a safe site and allow queued traffic to pass. When parking at a scenic spot along the road, be sure to make the best use of the sometimes limited space available, so as not to inconvenience other travellers wishing to stop at the same site. Always be aware of pedestrians. The road, although sealed and maintained to state highway standards is, nevertheless, challenging and , in places, a narrow winding drive. The scenery can be distracting - take your time, be aware of other road user and if you wish to enjoy the views pull over with plenty of warning. During winter (May to September), driving conditions can be extremely challenging. Freezing temperatures will cause the road to ice over in places. At this time of year the traffic numbers are low, so it’s advisable to leave later in the morning ( 9.00am onwards). Drive with extreme care, especially in areas where the road is in the shade. The road can sometimes be covered in snow and ice. You must carry snow chains for your vehicle during winter. (These are available for hire from Te Anau garages , Te Anau Hire Services or ask your Rental Car Company) Make sure you know how to fit them before starting your journey. There are many Guided Tour options from Te Anau to Milford Sound available if you would like somebody else to do the driving for you. The section of the road between the Hollyford Road junction and The Chasm is a restricted NO STOPPING ZONE as this is an avalanche area. Roadside information signs at Te Anau, Knobs Flat and Milford also advise current road conditions. If you have started your journey and find the road conditions are too difficult, you can leave your car or campervan at Knobs Flat and catch a coach to Milford Sound. You can contact the coach companies using the card-phone and freephone numbers located at Knobs Flat. During winter you must carry snow chains for your car, bus or campervan. If you are not confident about driving in winter conditions take a coach, relax and enjoy the winter scenery. Let someone else do the driving.